If your focus is more squarely on saving your money and counting every penny, we can help with that, too. There are countless ways to save money but certainly one of the most practical and useful ways to do that is with an app. Using the right app, you can keep track on your money and manage your finances without much effort. We discovered one highly helpful app for managing money. Let's see what the app is about. What is Adnoto Expense Manager all about? 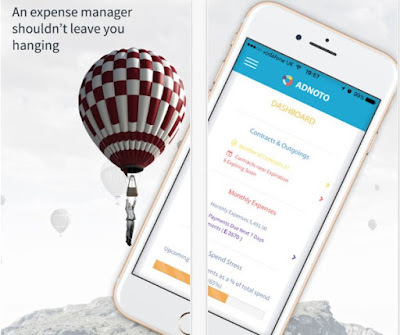 Developed on android and IOS platform, the expense manager app is quite easy for using, and suitable for anyone that needs finance tool for keeping track and managing personal or business finances directly on their smartphone. With this app users can manage their money, households, gadgets, or contracts easily without spending much time to control their money. On the app, users can keep tabs on how much they spend with the high-quality practical graphics for reading the data. Users can use it for free and without much effort spent on this smart money tracker. On the app users are getting elegant and quality interface. The users only need to sign up with their Facebook or Google account for free or only create their account for free. The dashboard on the app is offering users a complete overview of the user's data. Users on the app can look at contracts even if they are expired and find all important information fast and easy. The app is completely safe, protecting the user with the latest security technologies. The app is offering a spend stress indicator for tracking and managing money, informing users of their expenses in the next 7 days. The subscriptions and contracts of the user can be saved and users can check the expiration date, and also see how much they are spending each month, quarter and year. The device and Gadget manager on the app is allowing users to see how many devices they have and which subscriptions are attached to those devices. The smart reminder system is offering users to cancel subscriptions and contracts and getting reminders, of due payments the user has. Users can use the app anywhere and anytime they want, and also are allowed to manage other people's finances. Download the app on Google Play and App Store now for free.